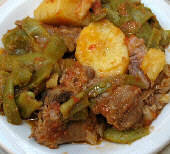 A great dish for vegetarians and vegans, this vegetable stew also meets Greek Orthodox fasting requirements. 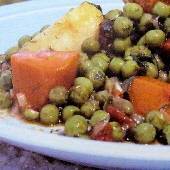 It calls for peas, carrots, potatoes, tomatoes, onion, garlic, and a traditional assortment of herbs and seasonings. In a stew pot, sauté onions and garlic over medium heat until softened. Stir in tomatoes and water (start with 1/2 cup). 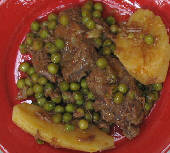 If using fresh peas: Add all remaining ingredients except potatoes. Bring to a boil, reduce heat and cook at a slow boil for 40 minutes. Add potatoes and when boil resumes, cook for 20 minutes more, until potatoes are done. 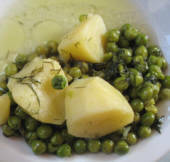 If using frozen peas: Add all remaining ingredients including potatoes, bring to a boil, reduce heat and cook at a slow boil for 40 minutes. Note: Add more (boiling) water as needed.